Leg Cramping: Minor Annoyance or a Serious Problem? Most of us experience some form of leg cramping at one time or another, and quite often it is nothing. But how would we know if leg cramps are due to a vascular problem that requires treatment? In his practice in the Division of Vascular Surgery, Roman Nowygrod, MD, FACS, sees many patients who experience unexplained sudden cramping, usually at night. Such cramping can affect people of all ages, although it occurs more commonly in older people. Patients may ask their primary care physicians about this pain, and if it continues for several months or more, may find themselves in Dr. Nowygrod's office. First, Dr. Nowygrod performs a physical exam that includes special attention to any sign of problems with the arteries and veins. "I am looking for any reduction or asymmetry in arterial pulses, or history of claudication," he says. "This often manifests as repetitive symptoms of cramping brought on by exercise and relieved by rest." Symptoms of venous insufficiency may include skin color changes, swelling, varicose veins, history of blood clots in the patient or in family members, ulcerations near the inner ankle, and other changes in the quality of the skin. Symptoms of arterial narrowing may include claudication (leg cramping while walking) as well as coronary artery disease, stroke, mini-stroke, and any past or present signs of arterial blockages in the legs. Depending on the individual's health history and physical exam, Dr. Nowygrod may then perform venous or arterial testing, or both. These circulation tests include Doppler and ultrasound, which are completely noninvasive and painless. "When primary care or other physicians have referred a patient to my office, they have already ruled out thyroid disease, kidney disease, heart disease, abnormalities in blood chemistry, and other health issues that could be associated with leg cramping. 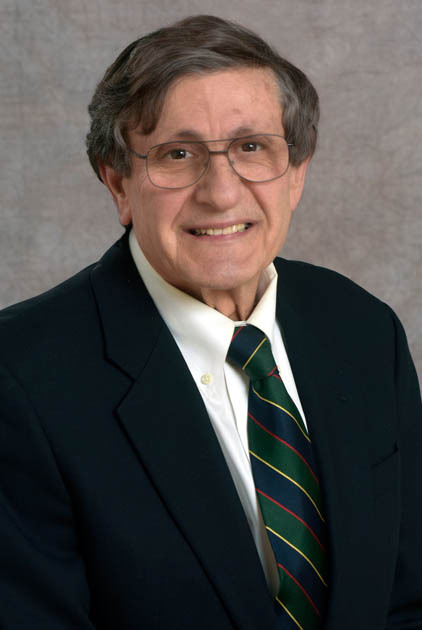 My task is to determine whether vascular disease is involved," says Dr. Nowygrod. Venous disorders, which affect about 80 million Americans and are about 20 times more common than arterial disease, encompass a broad spectrum from spider and varicose veins to leg ulcers and deep vein thrombosis. It is important that people receive evaluation and treatment at the earliest stage possible, because once venous problems cause significant damage to the skin, they can be extremely difficult to treat. 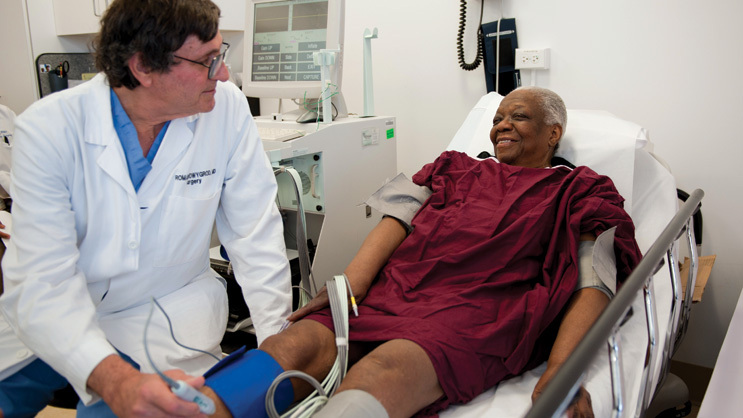 The Vascular Surgery Vein Programs at NYP/Columbia offer minimally invasive treatments for all forms of vein disease. Peripheral arterial disease (PAD) is generally the result of a narrowing of the arteries in the pelvis and legs. Like arteriosclerosis (also called atherosclerosis), or narrowed arteries in the heart, PAD involves narrowed or blocked arteries to the lower body or extremities, and has many of the same causes as its counterpart in the heart. Arterial disease often occurs as part of the aging process and mainly affects people over age 65, but younger people who have history of diabetes, high blood pressure, smoking, and family history of arteriosclerosis are at a higher risk of developing PAD. There are other relatively uncommon causes of arterial disease, such as popliteal entrapment syndrome, in which the calf muscle tendon impinges on the artery. This uncommon syndrome tends to affect younger patients. In most cases, Dr. Nowygrod is able to rule out the presence of a serious underlying vascular condition. In the absence of vascular disease, Dr. Nowygrod provides advice about how to manage hydration, weight, exercise, and muscle fatigue. He also prescribes recommendations for prevention, which frequently include important lifestyle recommendations such as a healthy diet, weight loss, and physical activity. When leg cramping is caused by vascular disease, treatment will depend on the severity and nature of the disease, says Dr. Nowygrod. In many cases, conservative, non-operative measures such as support stockings are sufficient, while in others, therapy may be needed to improve the problem. The most common procedures he performs are minimally invasive vein ablations, stab phlebectomy, balloon angioplasty with or without stenting, and extremity bypass operations. "Prompt treatment is important for preventing complications in the future," he explains. The full spectrum of treatment options are available at the Division of Vascular Surgery; "Regardless of the severity of a patient's problem, we have the resources to provide effective care, and almost always through non-invasive or minimally invasive therapy," says Dr. Nowygrod. Learn more about vascular disease at columbiavascular.org, or call 855.CUSURGE to schedule a vascular screening or appointment.